Samosas are a vegetable- (or meat-) filled pastry usually served as an appetizer at Indian restaurants. Now that I’m mostly gluten-free, I was interested in this version without the pastry. Ate several from the Hot Bar at Seward Coop and they were so good I went back later to get the list of ingredients. Then I made my own modifications. The first attempt turned out amazingly well. Place the lentils and slices of ginger in the 2 c. water in a small saucepan. Bring to a boil. Skim off any scum. Lower heat to a simmer. Cook for 60-90 minutes or until tender. (Tiny lentils may take less time.) Watch carefully during the last half hour of cooking. You want them dry (not soupy) but not burned. Set aside. If you aren’t using left over baked sweet potatoes, bake them for 40-60 minutes at 350°F or until tender when pierced with a fork. Allow to cool enough to be able to handle. Remove skins and chop into 1/2″ pieces. Place in large bowl. Boil the red potatoes until tender (approx. 30 minutes). Drain and mash gently with potato masher. Leave a few chunks. Add to large bowl. Cook the broccoli and peas according to the instructions on the package. Drain and add to large bowl. While the above veggies are cooking, chop the onion, carrot, tomato, and cilantro. Once the lentils and all the above vegetables are cooked, preheat the oven to 350°F. Heat the oil in a frying pan over medium high heat. Sauté onions and carrots until tender. Add garlic and ginger. Stir and cook for 1 minute. Add tomatoes and lentils. Stir. Add spices (curry powder, coriander, garam masala, cayenne) and cook a few minutes until the aroma is released and the mixture is relatively dry. Add sauté mixture to veggies in large bowl. Stir gently to combine. Add cilantro and salt to taste. If necessary add enough potato starch (or flour) to hold everything together. 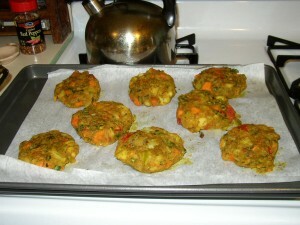 Form mixture into patties and place on a greased or non-stick or parchment-lined baking sheet. Bake for 30 minutes in 350°F oven, turning once half way through baking. 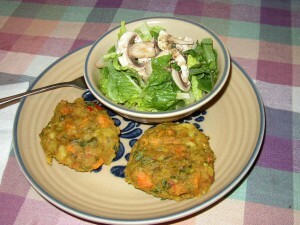 You may want to prep some of the veggies early in the day or the day before, or use leftovers. 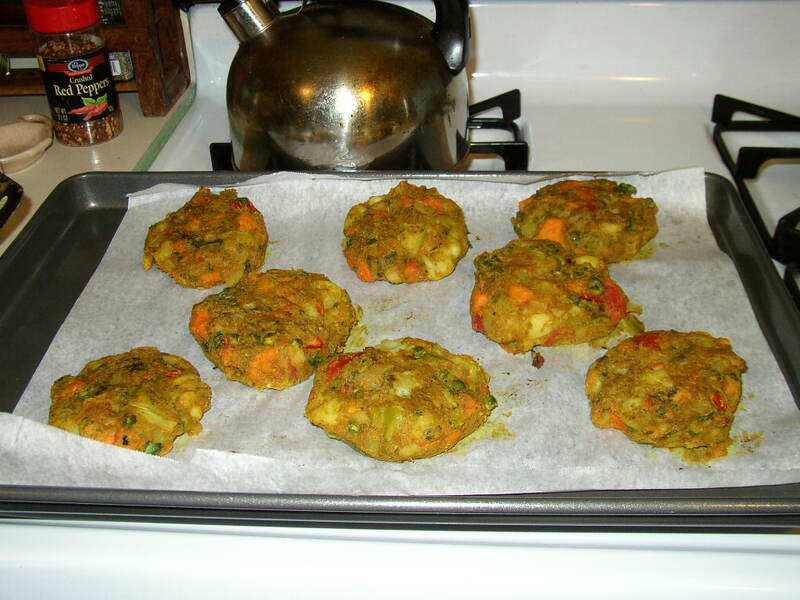 The patties may also be cooked on top of the stove. Dust lightly with potato starch (or flour) and fry in olive oil for 5-10 minutes per side.